Did you watch the NCAA College Basketball National Championship game Monday night? If you didn’t, a little school known as Butler University played in the biggest game of the school’s history. Yes, it’s true that they lost to Duke in a VERY close game, but I want to take a look at another sort of “loss” for a second. This epic run for the school is by all means a great buzz and brand awareness campaign. During the game “Go Butler” was a trending topic on Twitter at one point and for about half an hour during the game I left a search for the hashtag “#butler” up on my computer. By the time I closed it, there were almost 1,500 tweets for that hashtag. Needless to say, you simply can’t buy that sort of brand awareness for an institution. According to Wikipedia, Butler University has just over 4,500 students of which about 3,900 are undergraduate students. By most measurements that is a smaller sized university. When a smaller institution plays with the big boys on a national stage like this, it’s kind of a big deal. Oh, by the way Duke has about 13,500 students. Maybe this match-up isn’t a true David vs Goliath match-up unless you consider Duke’s perennial NCAA basketball success, but it’s still a great story! So what is all this lost opportunity that I’m talking about? I’m talking about all the traffic that Butler had coming to their website that on the surface it looks like they aren’t doing a strong job of converting. Two years ago I did a comparison of the Elite Eight teams’ web traffic because I wanted to show how a small school like Davidson really benefited from the extra awareness. For some of the larger school’s it’s almost expected for them to do well in men’s basketball, but Davidson really had a special year! 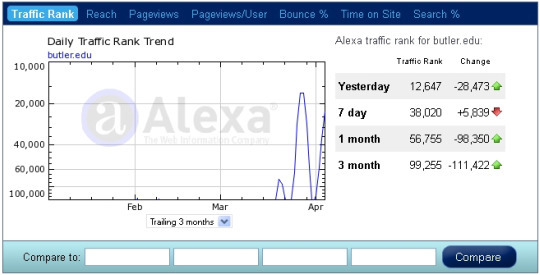 So let’s look at Butler University’s Alexa data over the past three months (below). I don’t have access to Butler’s web analytics, but they OBVIOUSLY are getting lots of traffic recently. You can’t 100% assume that it’s all from the tournament, but I think it’s a safe observation that it’s not a total coincidence. For those who don’t know about Alexa, they are a free service that gives you visitor traffic data to sites all over the web. It’s not a perfect metric, but it’s definitely better than nothing. If you remember any of my recent presentations you probably remember my argument about turning your website into a true lead generation or inquiry generation machine. If you want to know more, check out the slides from the presentation. Butler is getting all this traffic, and they aren’t doing anything special besides the standard “information for future students” link to try and generate more inquires and request more information from their homepage. For the record, they do have a great “Request more information” call to action off their admission homepage. 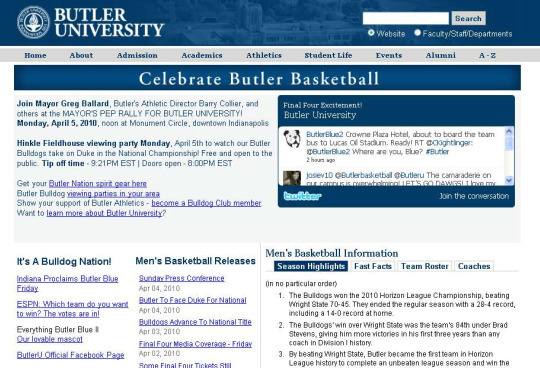 What Butler does have is a link to a Butler Basketball page built on their main site. Even it doesn’t have any sort of compelling offers to drive visitors to get more information or subscribe to sports updates or ANYTHING! Can College Web Departments Truly Succeed In A Situation Like This? College Web Marketers Aren’t Conversion Expert: Do college web individuals really think about the true conversion opportunities they don’t take advantage of all over the place? Every page is an opportunity to drive a visitor further down some conversion funnel, but I’m not sure enough higher ed web people think about this AT ALL. College Web Marketers Aren’t Agile: With the red tape and politics, is a higher ed web professional even given the freedom to act quickly when a major event like this happens? Yes, there are exceptions, but I know from personal experience how many people have their hands in the cookie jar whether they know anything about the web or not. College Websites Are Too Decentralized: Are colleges t0o departmentalized and segmented for a major sporting event to affect marketing and admissions activities to ride the excitement wave? I know many schools have multiple websites run by different people and each live in their own silo. Does this prevent people from taking an incoming wave and surfing it to the beach? Are there any athletic websites that are still managed as part of the overall institutions web team? So I don’t know all the answers on this one and I hope every institution can start thinking more about how they would react should their school be put into this wonderful position. What do you think? Am I being totally unrealistic here? It’s definitely something to think about and I look forward to reading your comments. Also kind of ironic that our post yesterday just so happened to be about champion Duke University’s use of Drupal! By the way, great information, Christina. And congratulations on a HUGE win! If there is a compelling case for having institutional control of your athletic web brand during a critical moment, these Cinderella teams in the Big Dance are truly the ones. With a site that looks the same as others, coupled with an inability in many cases to control the site from in-house, there are a myriad of missed opportunities, not so much for a Butler because a final four appearance is so significant, but those smaller less heralded schools thay fade away after two rounds or so. That’s where having a more centralized approach would be helpful, but only if it means deploying a well articulated plan. Maybe the decentralization works if web/marketing/atheletic hybrid folks are proactive in employing a rapid strategy in response to a huge opportunity like that, but given how much of the institutional brand collaterial is part of it, it would require all hands on deck being on the same page to unify the message and roll it out successfully. You bring up a number of good points and questions. There shouldn’t be a need to rapidly react to situations like this. Events (good and bad, even tragic) happen which drive traffic to an educational institution’s Web site. And there is the usual day-to-day traffic. The site should already be optimized for lead generation. For specific types of high-profile events (sports, fine arts, etc., and yes, even tragedies) pre-planning can be done to template out surrounding content such as sign-up forms, donation links, etc. Situations can be prepared for. It helps for admissions and Web folks to have a strong working relationship. Even better if someone in that equation has both Web knowledge and in-the-trenches recruiting experience, and an interest in proactively sharing that knowledge. It also helps to have adequate staffing, and, arguably, a Web person dedicated to content (a writer) in addition to the Web developer(s). Where I work, at least small tweaks across the range of the college Web site driven by admissions/recruiting perspective happen almost daily. (Content control is relatively centralized, which facilitates this sort of tweaking.) And there is always room for further improvement. @Ron - My old alma mater and former employer Wofford was one of those teams this year that made the tournament and even w/ a first round exit they cracked the top 100,000 on Alexa for a while w/ the buzz. @Robinteractive - you make good points and I guess what I’m really drilling into here is focusing on the conversion process and what is the fundamental marketing goal of a college website… well to recruit more students and get more donations because without those two the school imply won’t exist. What I’m really afraid is happening and I even heard someone say this is that schools think that dipping their feet into social media and pulling their Twitter feed, had a facebook fan wall and RSS updates into their website is internet marketing. Yes it’s a part of it but you still have to come back to the ROI of those activities and that has to relate back to revenue in some fashion. Every page is an opportunity. EVERY page IS an opportunity. That is the message I am going to take to our Webmasters’ User Group when I pass this article along to them. One never knows where someone is going to Google into their site and EVERY page should be considered an opportunity to convert that someone into a new admission. @Nancy. You got it. Every page is an opportunity. It’s really hard to get a call to action (CTA) on every page so start w/ your most popular pages and work your way down. Thanks Kyle for your focused attention on Butler. Our NCAA tournament story is amazing. It has created, and compounded, many wonderful opportunities for the Butler University community. Our website traffic has gone through the roof! So much so, that innovative improvements were made during the tournament to keep up with demand (read Wired Campus blog for more details http://chronicle.com/blogPost/Butler-U-Web-Site-Is/22381/?sid=wc&utm_source=wc&utm_medium=en). There are many facets to what we’ve learned, accomplished, and have planned for the future, too many to list here. Your point about conversion is poignant, but implying that we have lost a marketing opportunity two days after the final game was played may be a little presumptuous. our social media sites, not all of them, not to overwhelm them, but in a way that was organic and offered opportunity to get involved and stay involved. We created moments of community using Twitter, creating hashtags (#thankyoubulldogs) to bond everyone in a point in time (rally), which was highly successful. Check back with us after we’ve had time to digest the all of our new data and see if you notice a difference in our presentation. I hope you will. Thank you again for shining a light on our amazing university and for the opportunity to respond to your post. @Sheila - Thanks for leaving a comment and giving us some more details about your great accomplishment! Congratulations again! As you probably know there is a certain way of writing to be a little controversial to make a point. Thanks for letting me let Butler be the guinea pig on this one. I don’t pretend to know all the details, simply what I see on the surface from a quick hop around your site. I honestly probably spent more time than most of the 100,000+ visitors spent. I’d love to hear more of the results and the marketing and reach that you were able to establish from this accomplishment. If you would really be interested in sharing we’d love to have you write a guest post on this blog to share with the rest of us? As a former SID, I always have wondered about the “bounce” from the tournament. I think it is overplayed. The audience is basically divided into two groups: those who already know and care about Butler and those who haven’t any idea about them other than the fact that they are in the tournament. Using the tournament to attempt to reconnect to lapsed alums and friends of the school is great, but the majority of the people accessing the Web sites of these Cinderella schools care only about the basketball team. Everything else is just noise. They want to know details about the team: whether or not the star center is going to play, why they have that strange mascot name, and what’s up with the coach with the quirky demeanor. They may briefly look into the location (where the hell is Butler? Where in Northern Iowa is Northern Iowa? ), but that is all they really care about. These people are not going to become donors. They are not going to become students. They aren’t going to sign up for anything. They might buy a T-shirt or a hat as a novelty. They are curious about the university in it’s 15 minutes of fame, but that curiosity passes quickly. The Web is about finding that fine line between giving the visitor what they want and what you want them to have. I think you risk ill will by inundating them with information they don’t want. @Ross - Even with 100,000+ web visitors if 0.1% are high school basketball stars looking at a college and now are looking at Butler it’s worth it. 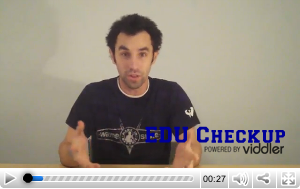 @Kyle I would love the opportunity to write a guest post on the eduGuru blog. We are in the process of getting materials together for an upcoming conference… as I go though everything I’ll keep this in mind and hopefully have something of interest to post in June. Does that work? I think you risk ill will by inundating them with information they don’t want.